The Department of General Services, business manager for the state on the Central Coast, will consolidate a handful of offices into a renovated warehouse just outside of downtown San Luis Obispo. DGS recently signed a $15.4 million, 15-year lease for the former home of The Workshop Urban Wine Collective, a custom crush winery operation at 2885 S. Higuera St.
Building owner Mike Kyle, who started The Workshop and also owns CT International, a manufacturer and distributor of medical and industrial products, is working with architect firms Arris Studio and Specialty Construction to turn the roughly 17,000-square-foot warehouse space into a 35,000-square-foot office building. In 2013, Kyle caught flak from neighbors living near the winery operation in the Villa Fontana condo complex on Fontana Avenue and Loma Bonita Drive. Residents had complained a number of times to the city that fumes from wine production equipment operating outdoors were invading their neighborhood and impinging on the public health. Additionally, The Workshop faced violations, including the facility operating outside of permitted business hours, failure to enroll in the city’s Industrial Waste Program, the accumulation of grape waste and fire code violations. Since then, the office project has been in the works and Kyle is moving the custom crush operation to another property, according to Lee & Associates broker Marty Indvik, who represented Kyle in the deal. The renovation project cost is about $6 million. Kyle purchased the property in 2007 for $2.3 million. With the new facility, Sacramento-based DGS will consolidate some of its Central Coast operations for CalTrans’ engineering group. The LEED Silver-designed project is expected to be complete by June 1, 2016. The Vines, a 164-unit multifamily property that is part of RiverPark, a master planned community located at 3040 N. Oxnard Blvd. in Oxnard, was sold last month in deal valued at more than $55.5 million. Adrienne Barr, partner at the West Los Angeles Berkadia office, negotiated the transaction, which produced a per-unit price record for Ventura County in the last 10 years. Setting the bar for properties with more than 100 units, the property sold at a per-unit price of $338,628. The buyer was Los Angeles-based Champion Real Estate. The sellers were a partnership of Corona Riverpark Promenade and Corona Riverpark Luminaria, represented by Dallas-based RSF Partners. The property was built in two phases, with the first 80 units built in 2013 and the remaining 84 units completed in 2014. RiverPark is surrounded by seven different parks with playgrounds, basketball and tennis courts, picnic areas with barbecues and water fountains. The complex is a mix of two- and three-bedroom townhomes with granite kitchen countertops, washer and dryer units, balconies or patios, walk-in closets, hardwood flooring and attached two-car garages. The property was 95 percent occupied at the time of the sale and was part of a 1031 exchange for Champion. The Vines is situated near Pacific Coast Highway and State Route 101. 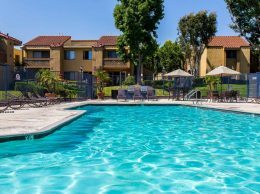 It is within walking distance to high-end retail shops, dining, entertainment and less than 10 miles from both Ventura Beach and Channel Islands Beach.